These tracks are recommended mostly for mountain bikes. You can take some shortened tracks on a trek bike. The most difficult track, its road profile and surface varies. Use the roadway at the beginning to make your ride easier. The tour will not lead you to the peak of Klínovec hill, but you can still visit it; turn onto a path that will lead you up there - after 1 km. More than a half of the tour is higher than 1000 m above sea level and the trail goes around Klínovec and gives you the most beautiful views of the Ore Mountains. Klínovec tour can be connected to the Popov tour. They meet at the place called “U klád” about two kilometres from Boží Dar. The length of this prolonged tour is 52 km and challenges your fitness condition. Very difficult track which vary in profile and terrain. The most difficult parts can be reached by foot. This tour may be shorter, as you turn onto a roadway in Mariánská and than continue through the Abertamská crossroad to Boží Dar. The shortened track length is 24 km. This tour gives many beautiful types of scenery. 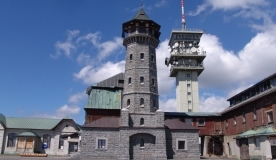 We recommend seeing Popovský kříž viewing point which is about 400 meters walking distance from Popov. On this tour you will also pass by the 500 years old linden tree with 10 meters of a tree trunk perimeter. Tour also goes along the Nature Track Jáchymovské peklo (Jáchymov Hell) which shows the history of mining in Jáchymov. It is linked up with Klínovec tour in place called “U klád” (green-marked) and with the Central tour (yellow-marked). Less difficult tour. Only going up and descending Plešivec hill may be more demanding (III.- IV.). Tour runs around the National Nature Reserve Božídarské rašeliniště (Boží Dar Peat Bog) with a natural track. Track crosses Blatenský příkop – a marvellous water channel build in 1540 - and goes around the hill Božídarský Špičák (1115 m above sea level), the biggest basaltic mound in Central Europe. This tour is connected with Popov tour (green-marked) and with one of the Pernink tours (2002), which is marked by green triangle marks and runs from Myslivny and leads to Pernink and Potůčky. Not difficult, mostly runs on roadways. More demanding while going up. The tour goes along the Czech-German border. It is connected to the Mílov border crossing path and to a hiking track in Potůčky. It goes right through Zlatý Kopec Natural Park where you can see beautiful sceneries Holubí skalky rock walls. In the most far away part of tour goes to village Potůčky, famous for its market. In Potůčky, you can relax in a swimming pool. The tour is connected to one of the Pernink tours (no. 2000) which is marked by green triangle marks and goes from Pernink to Potůčky, Myslivny and continues to Plešivec and back to Pernink. Find more information at the Tourist Office Boží Dar where you can also purchase cycle-maps.